I’m just recovering from an extended period of slouching around watching TV and streams via BBC’s extended broadcast of the Glastonbury Festival. It was for the most part an easy listening experience, sitting there with a drink (and toilets) close by, sometimes with friends and family talking about the acts, sometimes on my own and fully engaged, and sometimes also leafing through the paper or even doing a bit of work. For the most part the shows were really well screened with reasonable measures of crowd scenes with the main focus on the performers. The bits in between – the short interviews, plugs for new releases, mini-docs and presenter links were for me completely disposable and seemed to be aimed at an audience who had stumbled on the transmission by accident and there to reassure them that Aunty Beeb was looking after them…. The best part of the BBC’s output was on iPlayer where you could watch full concerts un-introduced and un-interrupted (though the stream was sometimes pretty low quality). I even stumbled on a webcam that showed the Pyramid Stage in between performances with the audience wondering around (no doubt either to or from the toilets…) and the stage crew doing their stuff. Sitting at home, I probably got to see more of the show than many of those who actually attended in person, but… and I’m sure you know what is coming… I wasn’t there. 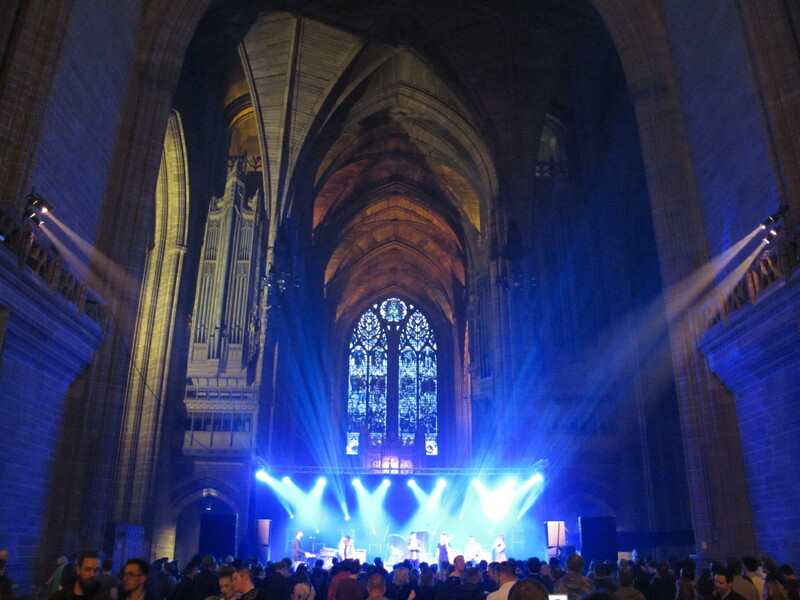 However, at the beginning of May, I was at Liverpool’s annual hosting of the Sound City festival. This is a purely urban event (I can’t remember anything on grass, even in the city parks), making use of dozens of small and medium sized venues around the city centre, showcasing primarily unsigned and newly signed artists, with a few headliners like The Kooks and The Hold Steady. It’s an industry event with a conference running alongside the gigs providing plenty of opportunities for learning and networking, again with a couple of headline presentations, this year by Thurston Moore and John Cale. For three days I did the same thing I had done last weekend but instead of it being virtual it was real. Sometimes with friends and family, sometimes alone and fully engaged, often with a drink, I experienced a lot of different music in a lot of different venues. I didn’t even get close to seeing all that was on offer (there were more than 200 artists) but what I did see was at its least, interesting, and at best inspiring instant devotion (e.g. San Fermin… check them out). It was of course also sometimes tiring and ear numbing. Walking around a city I know so well, but seeing it transformed into a giant multi-room venue was fascinating. The organisers had not only taken over favourite old venues like the Kazimier and the Blackie but created new stages such as the Garage (in a covered car park) with its own new temporary neighbourhood in which pop-up stages, bars and restaurants co-existed for a short time. The crowds inevitably went for the acts they knew and some of the venues and out door stages closed doors early as they filled to capacity, but there was plenty of music available within a few minute’s walk, and the bigger names would probably be on tour again soon …right? My Sound City experience was full of experimentation, happy accident, shared involvement, and hearing new stuff – leading to strong memories and the desire to do it all again next year. One of my daughter’s favourite bands from the Glastonbury TV show was Royal Blood – I think she was impressed when I casually said oh yeah… saw them live at Sound City. My Glastonbury experience was interesting, relaxing, enjoyable and accompanied by a slightly guilty feeling that I should really be there rather than sitting on the couch. Undoubtedly the ‘being there’ experience of Sound City was one I would remember with more resonance and power than the ‘armchair’ one – at least partly because what I experienced in May was mine, I chose where to go, what to look at, and what to hear. Although I could switch channels and streams – my Glastonbury experience was mediated by the BBC – it was their interpretation of what I, and millions of other viewers, might want to see. In the UK we are certainly fortunate that we get to see high quality outside broadcasting of the biggest popular music events uninterrupted by advertisements, as far as I’m concerned my licence fee fully justified in a few hours of viewing. But I know the people who were at Michael Eavis’ farm last weekend will have a wholly different memory of that event when they recount their tales afterwards – and they will have earned the right to brag to the rest of us. Rob Kronenburg thinks Being There wins. I have to agree. What do you think?